Recently, I was delighted to be invited by Carol, from Sew Sisters Quilt Shop, to be one of the host bloggers on an all Canadian blog hop starting Nov. 18th. I'm so excited to be a part of the fun and can hardly wait for it to start. Believe me, you won't want to miss this! 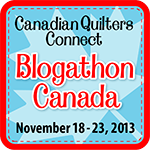 Okay, so what is Blogathon Canada? 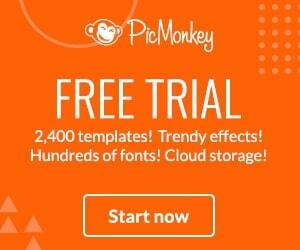 Each day host bloggers will introduce themselves and their work on their blogs. They will include links to more blogs from their province so you can visit those blogs as well. 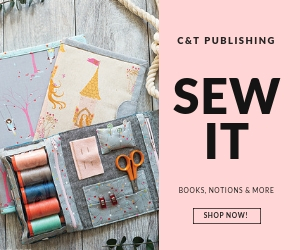 The host bloggers will also host a giveaway of some of their favorite goodies from Sew Sisters so you have a chance to win every day of the week! This year Sew Sisters has teamed up with Aurifil, Northcott and Robert Kaufman to bring you even more fantastic giveaways! 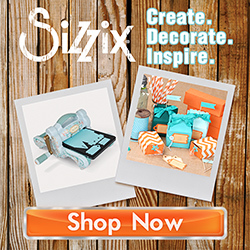 Check out their blog for more and see how you can join the party! 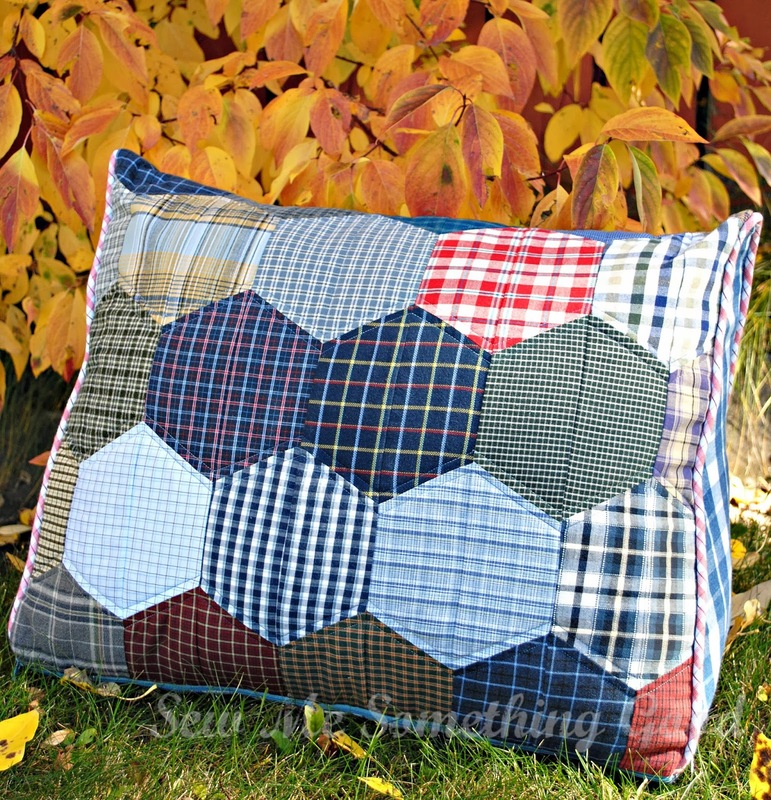 I've included the schedule below and wanted to mention that if you are a Canadian quilter or crafter blogging in Alberta, please, send me your blog address ASAP and I will be sure to add you onto the list I will be sharing for my day on the hop (Nov. 20th). I'd love to get to meet you! I thought I'd go for a second entry into the Blogger's Quilt Festival and selected the quilt I made for my husband as an entry into the Two Colour Quilt category. Made especially for my hubby, who loves the colour orange and needed his own quilt for keeping warm while he digitally paints every evening. 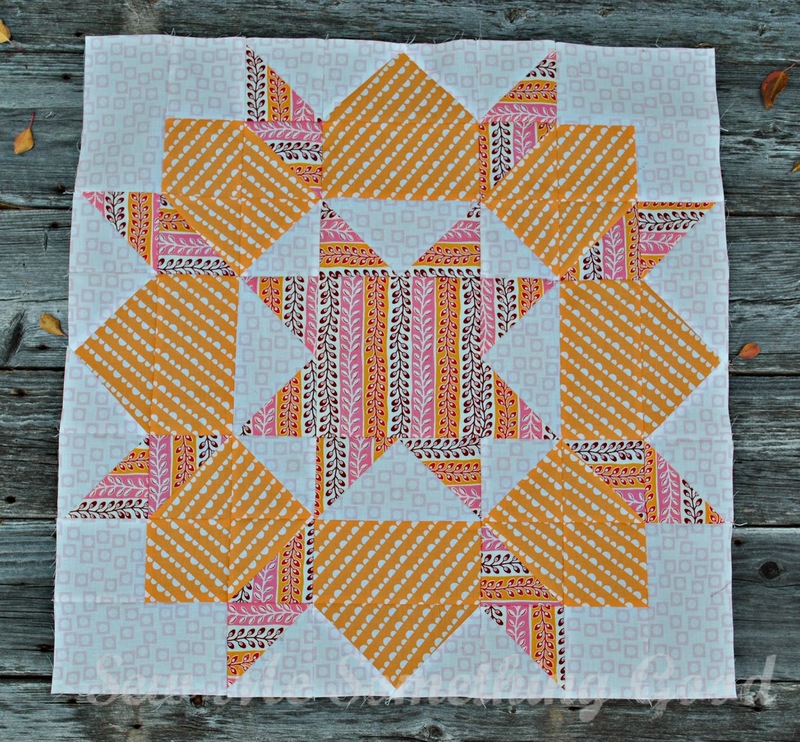 I used Elizabeth Hartman's Crazy 9-Patch block tutorial to make the ManDarin quilt (I just eliminated the lattice which created negative space in the original). 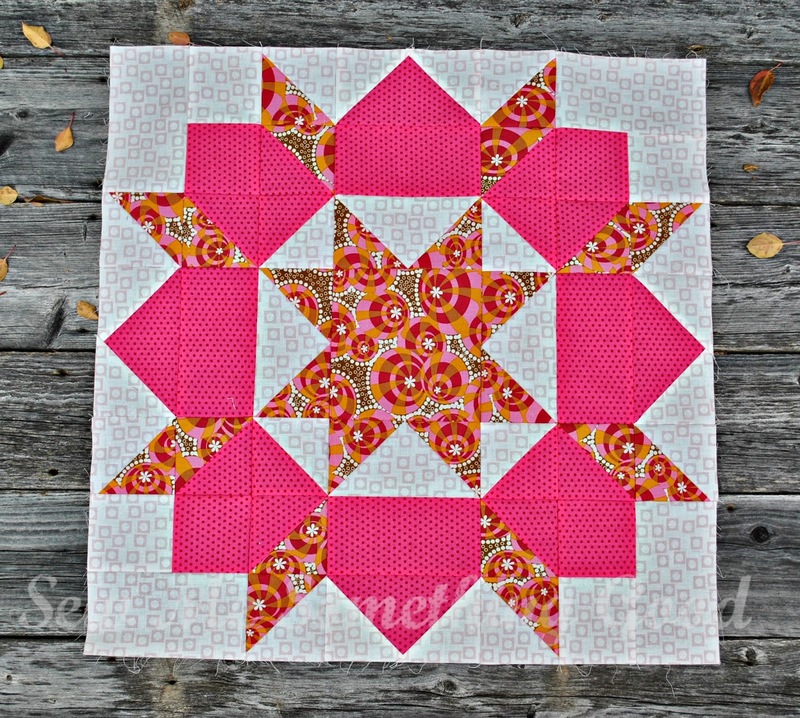 This pieced backing is one of my all time favourites! 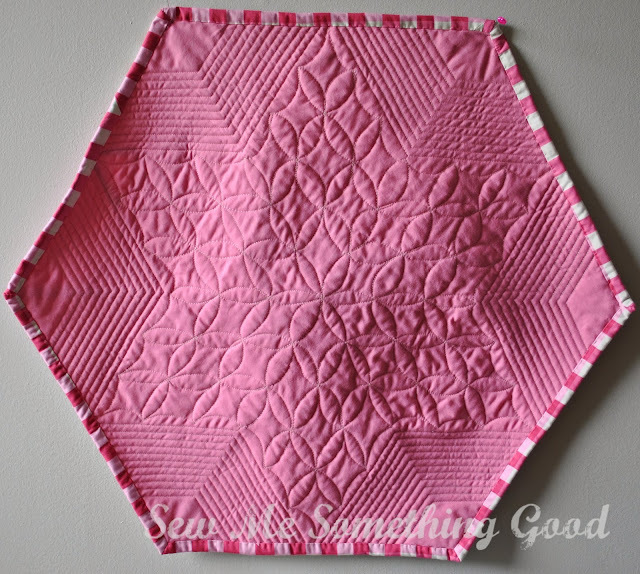 with leftover blocks on the back! A vast variety of orange fabrics were gathered to make these blocks and the odd bit of chocolate brown breaks things up. Oh, look! 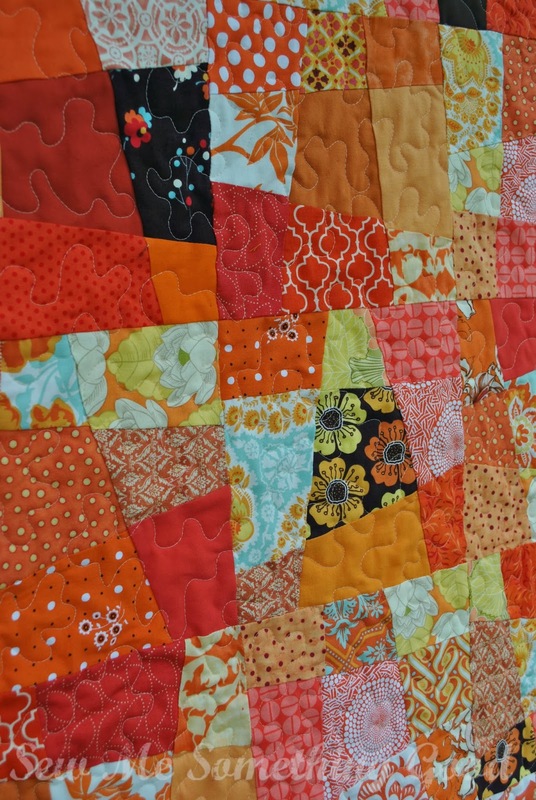 There's one more day for you to enter your own quilt(s) into the Festival and time to visit all the wonderful entries. How lucky we are to have Amy organize this wonderful blog-land event! Thanks, Amy! 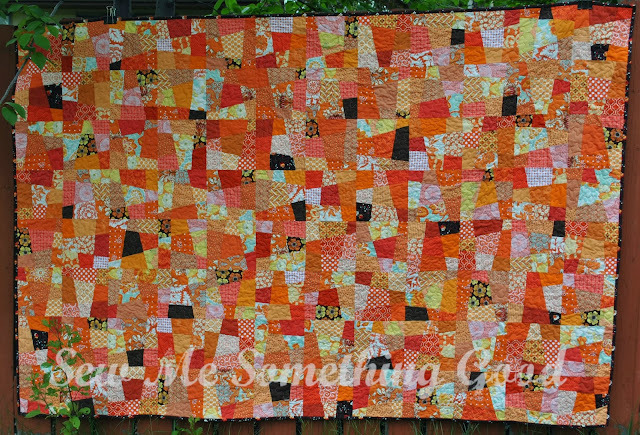 QBAM is my entry for the Wall Hanging Quilts category in the Blogger's Quilt Festival. I want to thank Amy and all the Festival sponsors for this wonderful event. 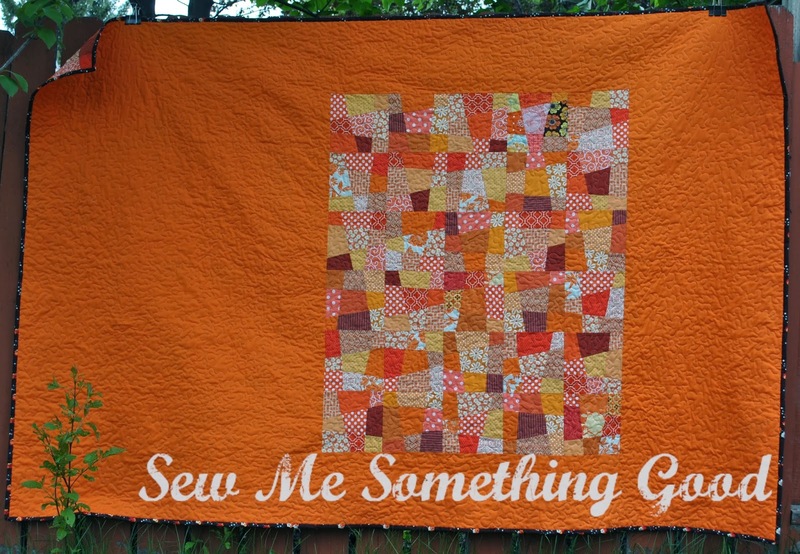 I look forward to this fun, biannual round-up of quilting inspiration. I have my husband to thank for the name of this project. 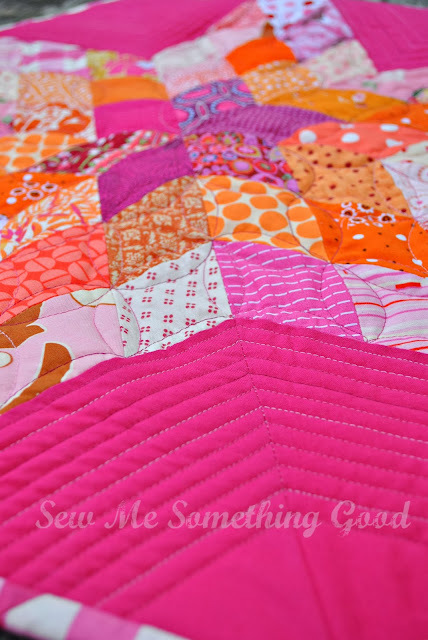 The acronym for my little quilt stands for "Quilt it. Bind it. And. Move on." These words make me laugh. 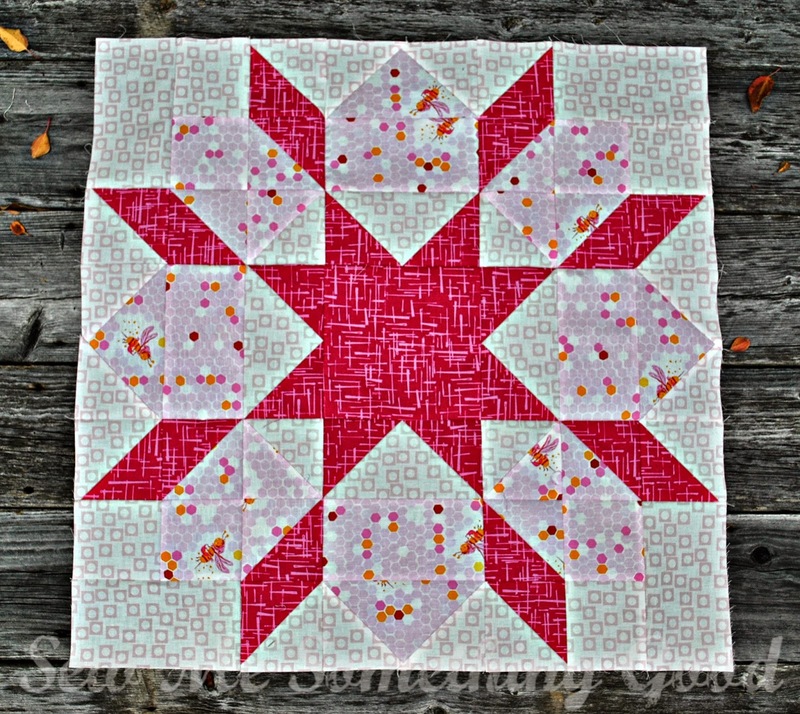 I had been dithering over how to proceed after stitching up this star block sewn from some scraps and asked my husband what he thought I should do. 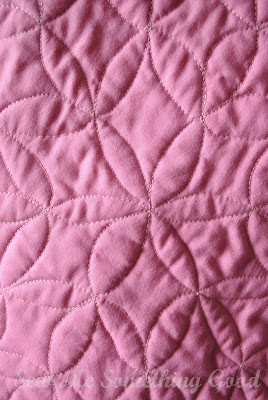 It seems I always feel I should make a bed sized quilt whenever I start making blocks. Crazy, but true. 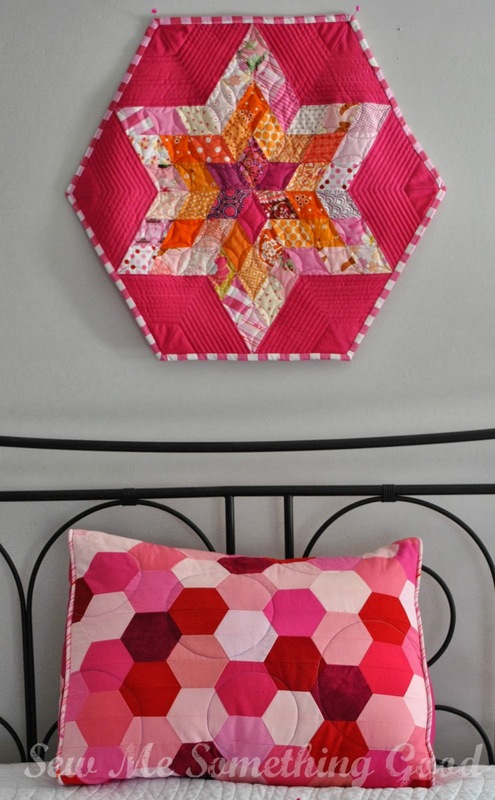 - and to stop thinking that unless they were made into a bed size quilt, that they aren't useful. That I needed to realize that they are art and therefore already useful. 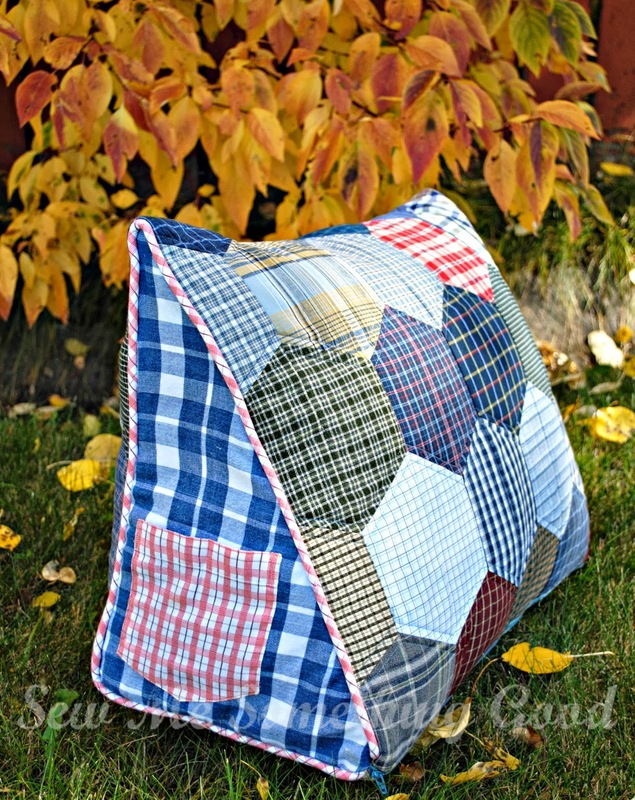 He ended, with the phrase, "Quilt it. Bind it. And. Move on." Hence, the name of my wall hanging and a wonderful bit of advice. Thanks so much for stopping by, I hope you enjoyed your visit and will be back soon! Lucky for us, we have the rest of this week to visit all the quilters artists that have linked up over at Amy's. Plus, you still have time to enter, too. Yay! Truly, the possibilities are endless and what could be more quick and easy for slimming the scrap stash! 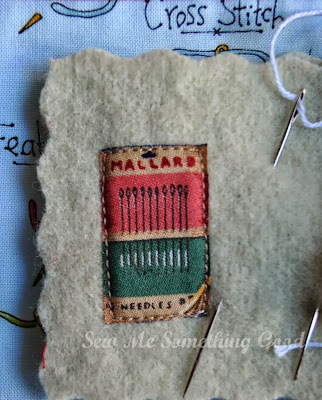 Just remember to keep the machine needles used for stitching cardstock separate from those used for your other sewing projects. Sewing cardstock dulls needles! Some projects are just too good to only do once. I like that it has a little more kick to it now that I traded a Denyse Schmidt print for Anna Maria Horner fabric as the star center. Not that I don't like the DS fabric, but I think it will be better used in something else. 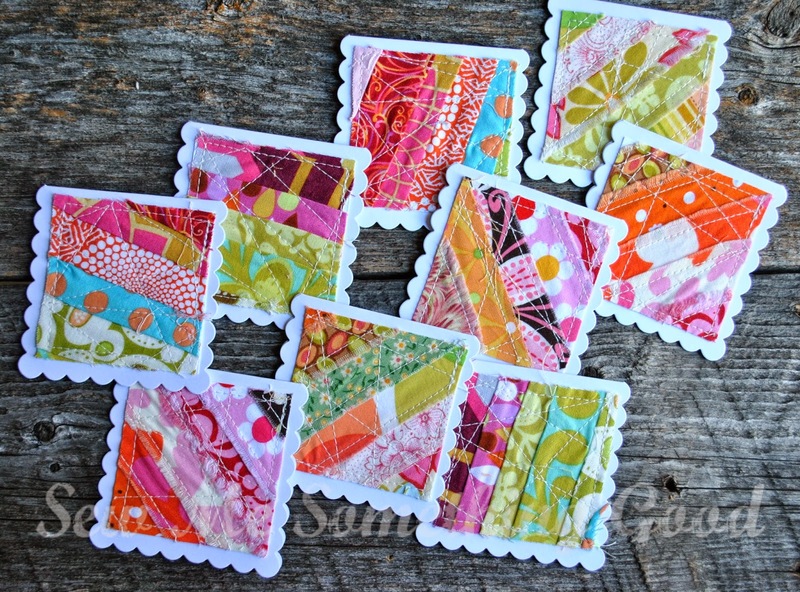 Next up I paired some Flea Market Fancy with an orange print from Happy Go Lucky. 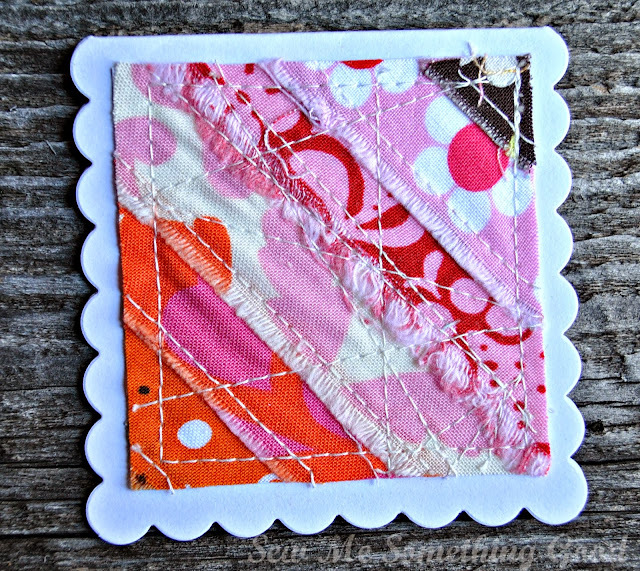 Both are directional prints, but I think they worked out pretty nicely together. 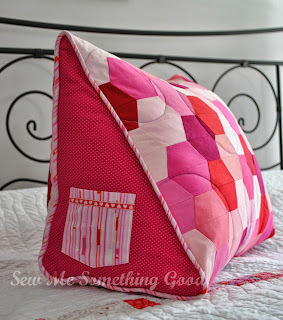 Especially those corners where 4 pieces of that diagonal print come together. Fun! I saved the best for last. The final block makes me a little giddy. 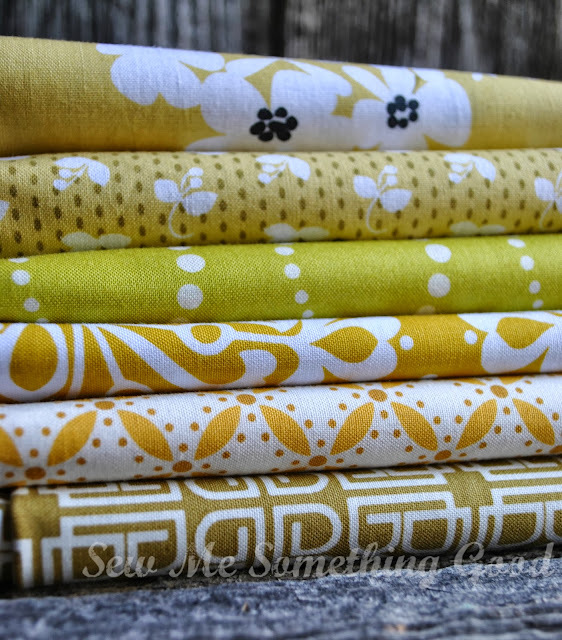 I'm loving the Madrona Road print with the bee print from Briar Rose. Such yummy colours! I'm totally wanting that block for the center of the quilt if I go for a 9 block quilt. The idea of making 2 small quilts to sell is also appealing. What do you think? 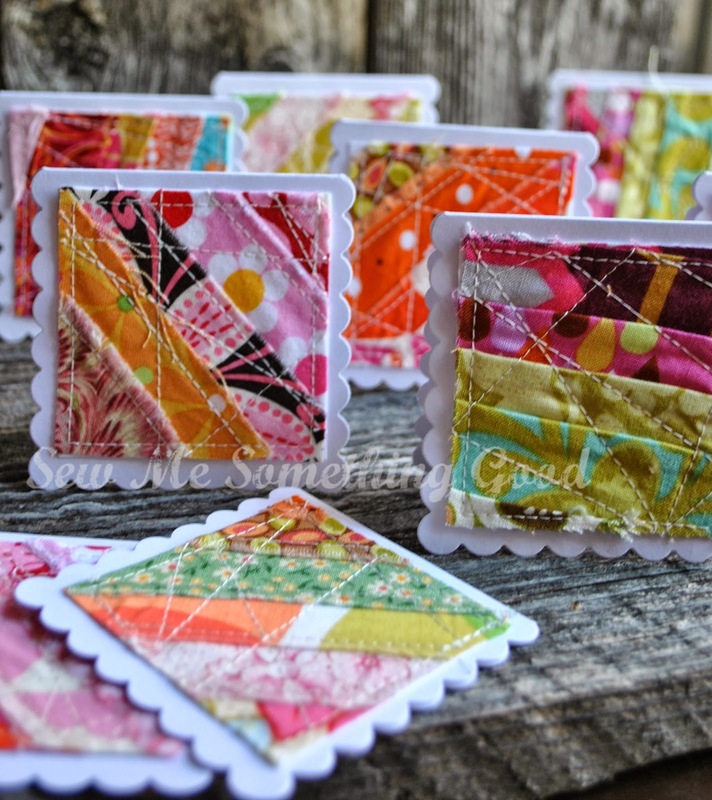 Do you think I have a better chance of selling a large Swoon or 2 small Swoons? Once I get that decided, it's time to get the sashing strips and borders cut and added! 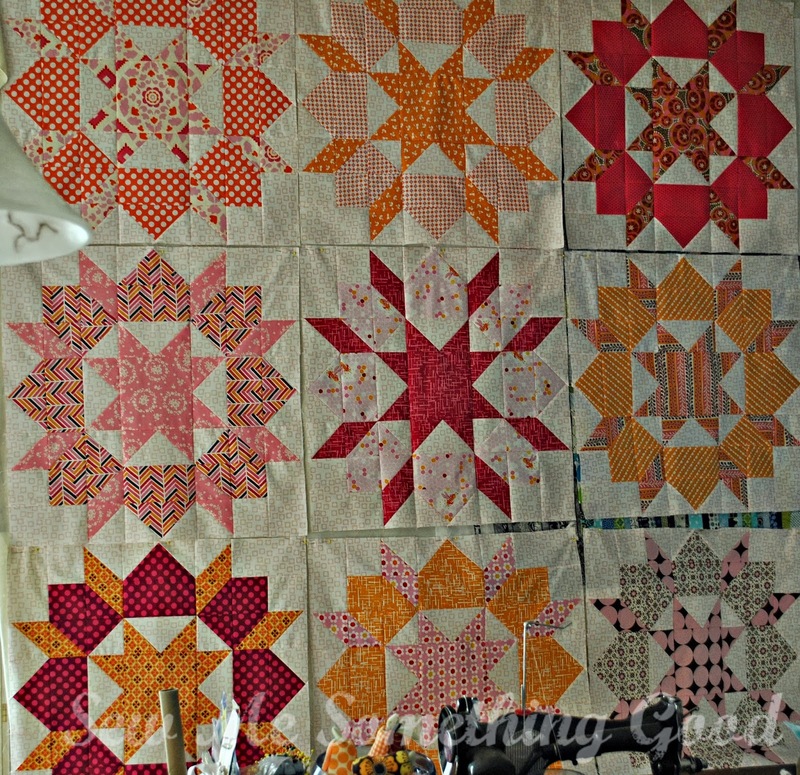 I debated changing fabrics in the bottom right hand block, but have decided it's incongruity adds something to the overall look - IF I go with making one large Swoon quilt. If I decide to make 2 small quilts, I think this will be the block to pull out of the line-up. Looks like I'm making a little progress on my fourth quarter FAL list. Not a bit goes to waste. 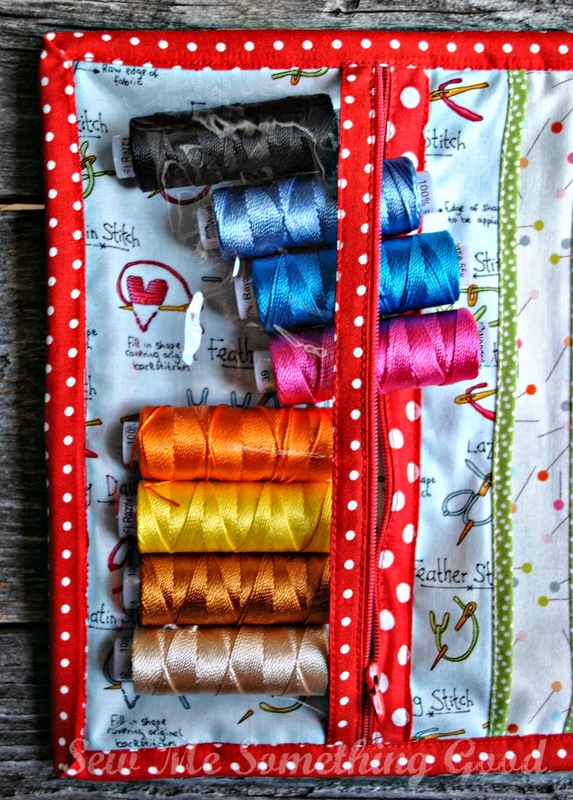 I've mentioned my organization system for fabric before, so you know that I have see-through containers to house notions and others for fabric. 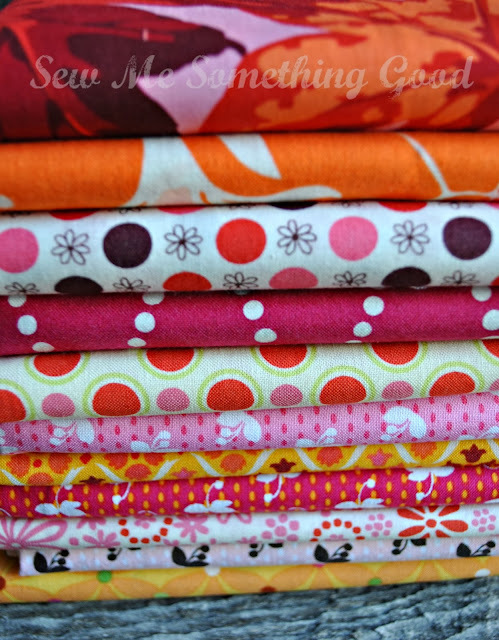 I keep bins for cut squares and bins for cut strips and other bins for odd shaped scraps. 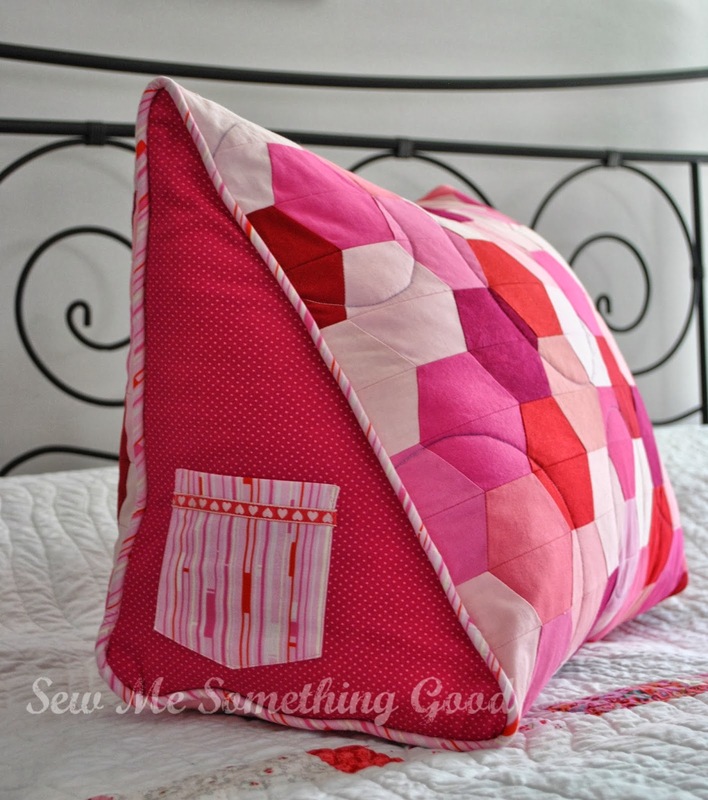 However, you may not know that along with having separate containers for each size of leftover strips ( bins for each 1" to 4" in half inch increments), I also have a bin for the long narrow bits of fabric that come from squaring the ends on yardage. Yes, I keep even those narrow, frayed bits. Why? I stitched those stringy scraps onto cardstock, "quilted" them and then cut them to fit onto the fronts of some tiny blank notecards. while on others, I pieced to hide the fraying edges. Now I have a collection of unique fabric happy notecards to use. My lovely friend makes so many pretty projects using scraps that I call her a "scrap magician". She hosts a scrap challenge each month and this month, for fun, I'm entering with this post. and you would think that because it's pink and I'm the only girl in the household, that I wouldn't have to share it. 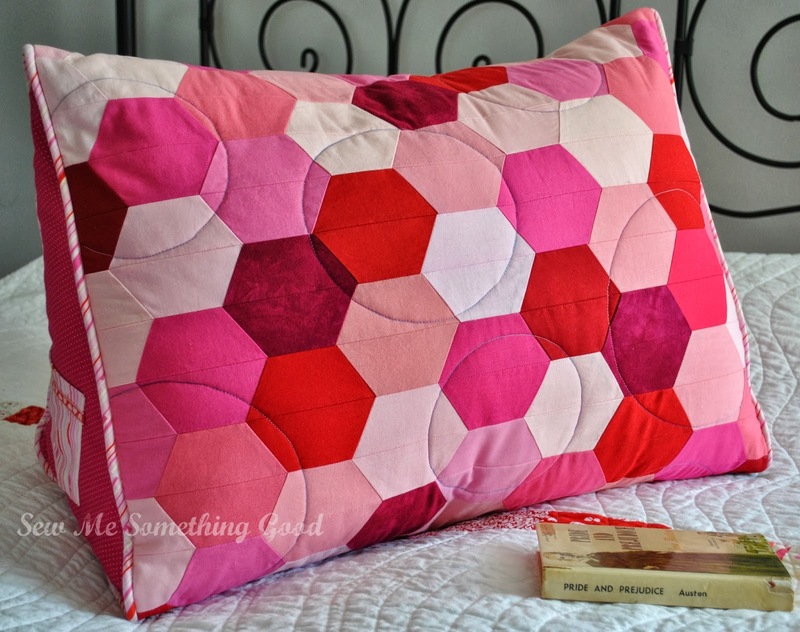 There is one other reading pillow in the house. It's my first version of this design and is dubbed the "Manly Reading Pillow" and belongs to my oldest son. However, I think he'd notice if I tried to take it. has some great sale prices on pre-cuts starting today. Seems like a sign, don't you think? P.S. If you're as tempted as I am, just be aware that the sale prices will disappear the evening of Oct. 19... so don't delay! I find I can't put Patchwork, Please! back on the shelf. 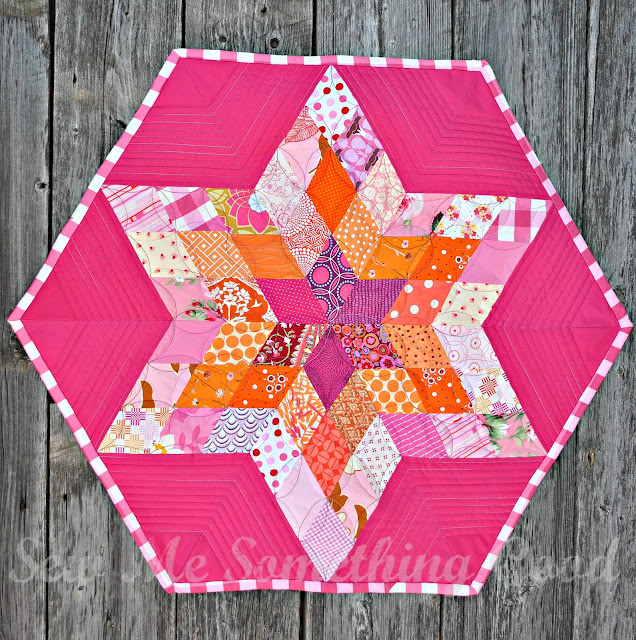 Yes, that means I've made another one of her clever projects! 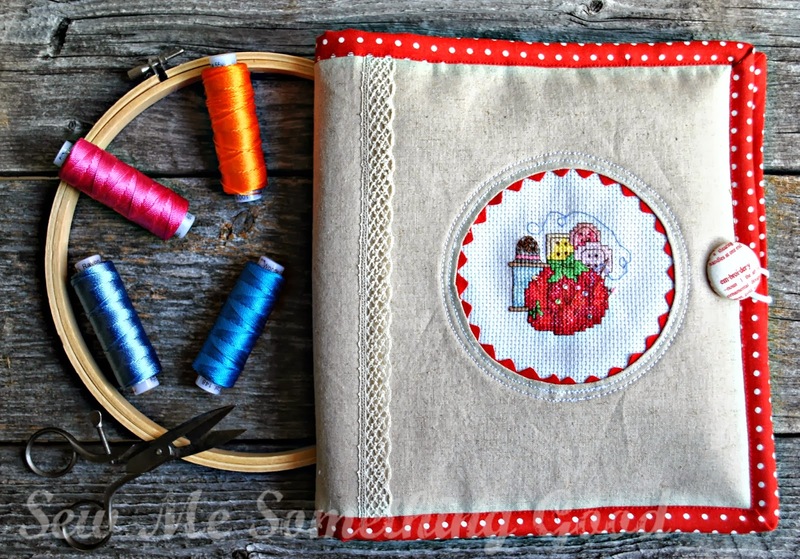 This time it's the Sweet Trips Embroidery Pouch. I thought maybe this pretty organizer will spur me onto finishing a particular embroidery project I've had in the works for a few years now. 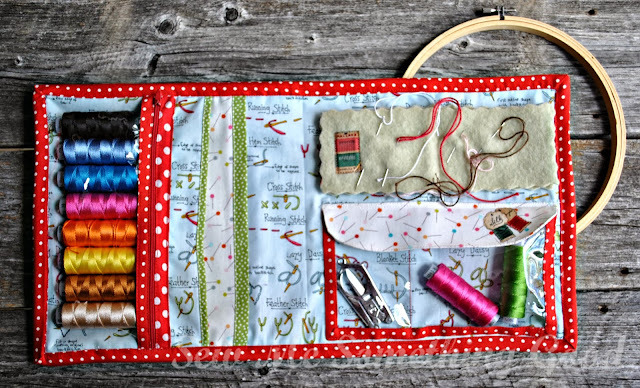 ;o) I love a good organizer! 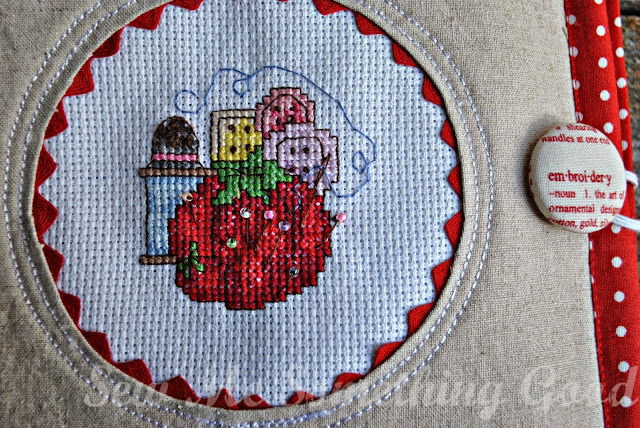 My cross stitch pincushion has tiny beads to represent pins and looks even lovelier framed in some vintage ric-rac. I'm also loving that self-made button because I was able to fussy cut the word "embroidery" for it. Inside, you will see that I made one change to the original pattern design. I added a second vinyl pocket, this one with a zipper, so it nicely holds those new embroidery threads from Wonderfil. 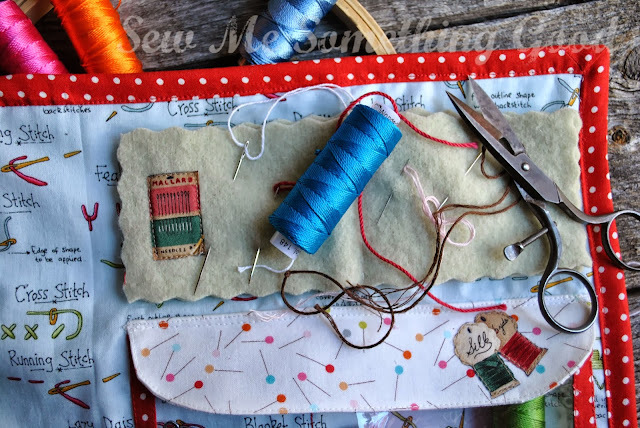 Next, I used a felted sweater, cut it using the wavy blade in my rotary cutter, then added a fussy cut "needles" applique to jazz up my needle book pages. and one final fussy cut applique for the back cover. 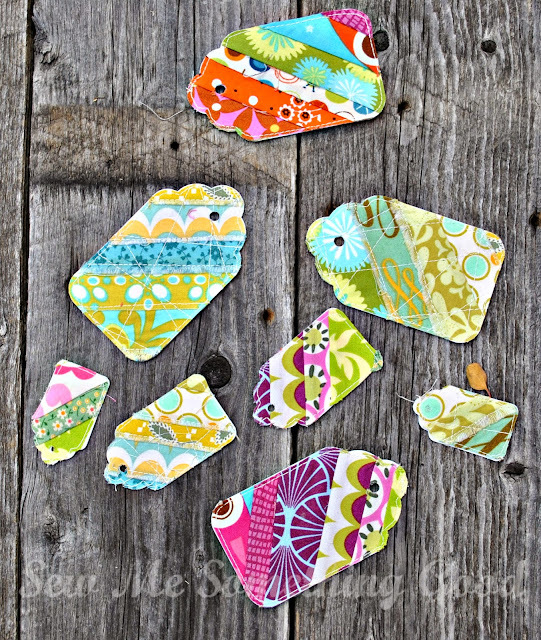 Another fun project that I will enjoy using. 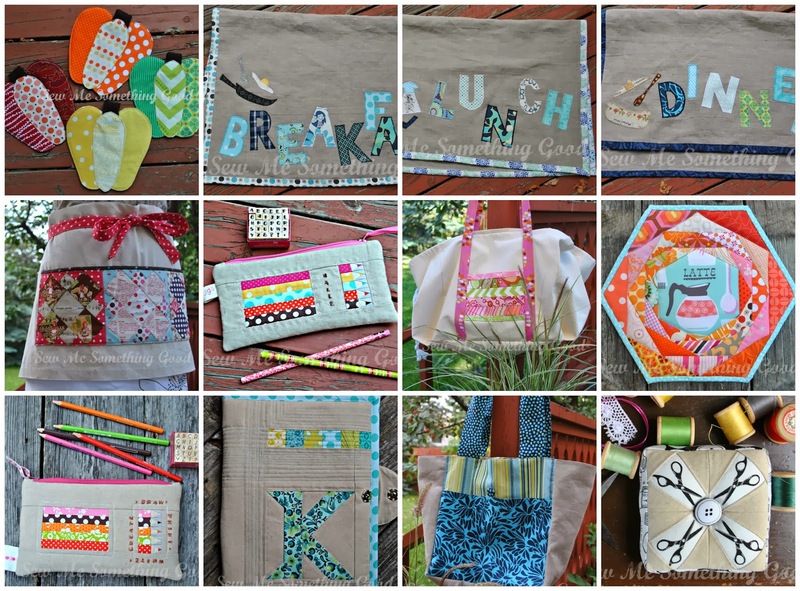 Just for fun, I made a mosaic of the projects I completed during the sew along. 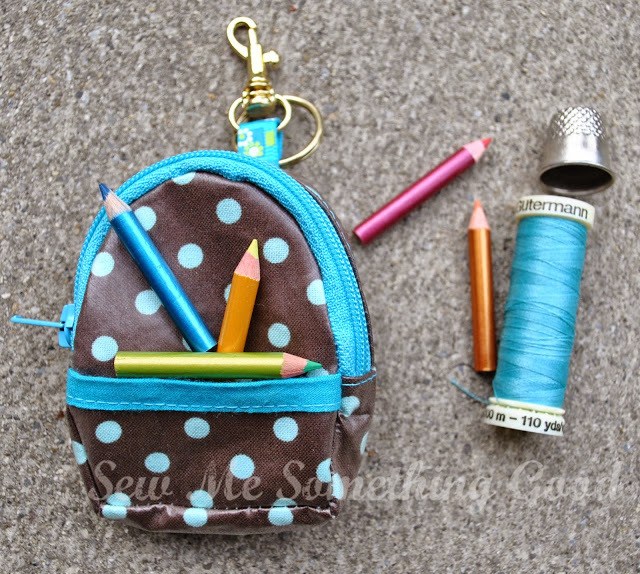 You'll notice that I made two of the paper-pieced pencil cases (one as a gift and one to keep ;o). Visit me on Flickr to see each of these projects or on my blog using the search box (on the sidebar). Sales are so tempting this time of year - as is this colour bundle I made from orders placed to different online shops. that I can't stop playing with and admiring. Seriously crushing on this fussy cut applique! Yes, even my serger has seen some action. More to come on that! Then, come back tomorrow to see what project caused this mess. 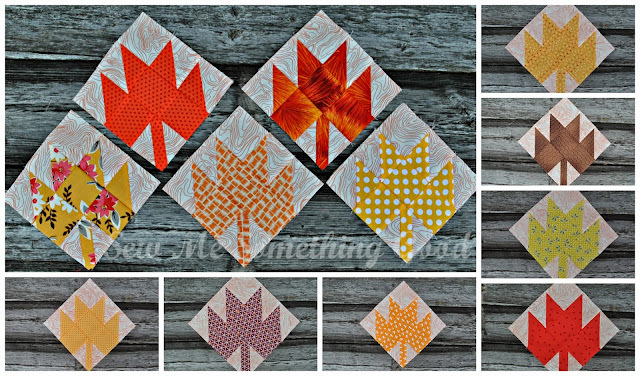 I've been having a lot of fun stitching together blocks for a Modern Maples quilt and thought I'd show you how things are progressing. 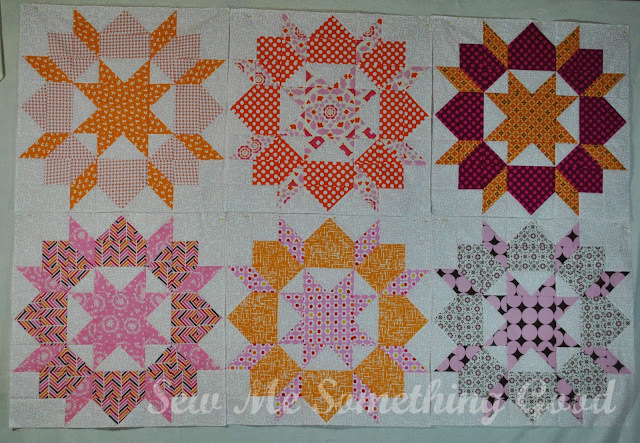 Below is a round up of the latest blocks made - some finish at 12", some at 9" and a handful at 6". I'm loving them more and more. Maybe because all the leaves are disappearing off the trees here. Fall goes by way too fast! 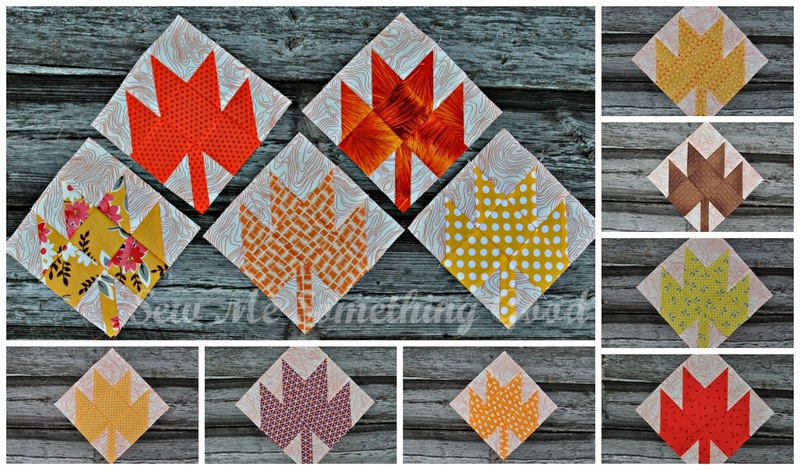 I'll add these latest blocks to the Modern Maples Flickr group. Since I wanted to try my own layout for my quilt, I've sketched out an idea and discovered I need to mark a grid (onto a bed sheet - as a temporary "design wall"), to help me. 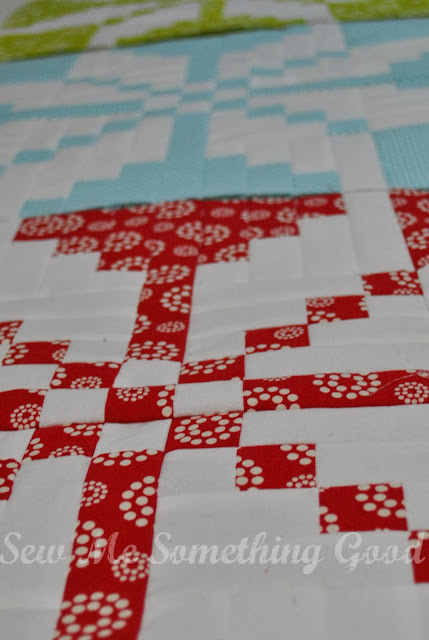 Trying to do the layout without a grid to guide me has proven rather difficult because of the varying block sizes (ask me how I know this... ;o). 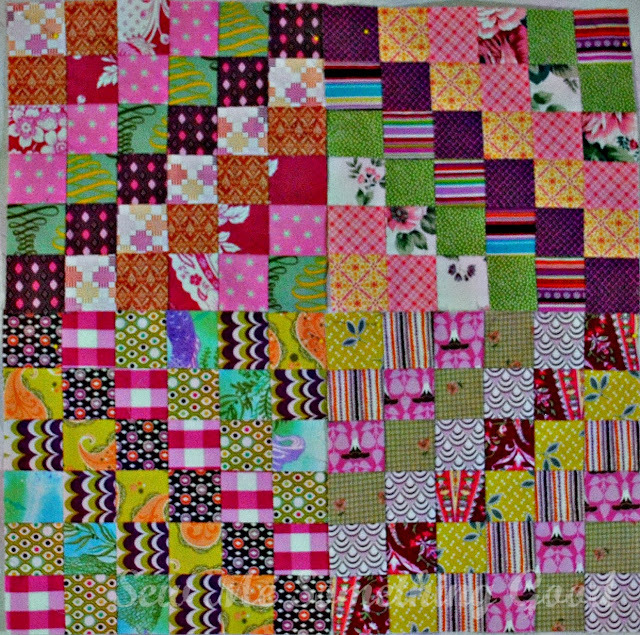 Until I get that sorted, here's a look at all the blocks I have made. 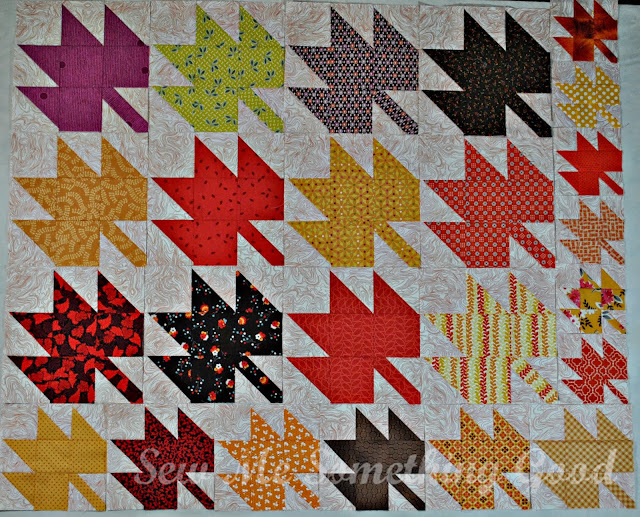 This is not my final layout - I just wanted to show all the blocks together! At this point, I'm not going to say I'm finished with making blocks. 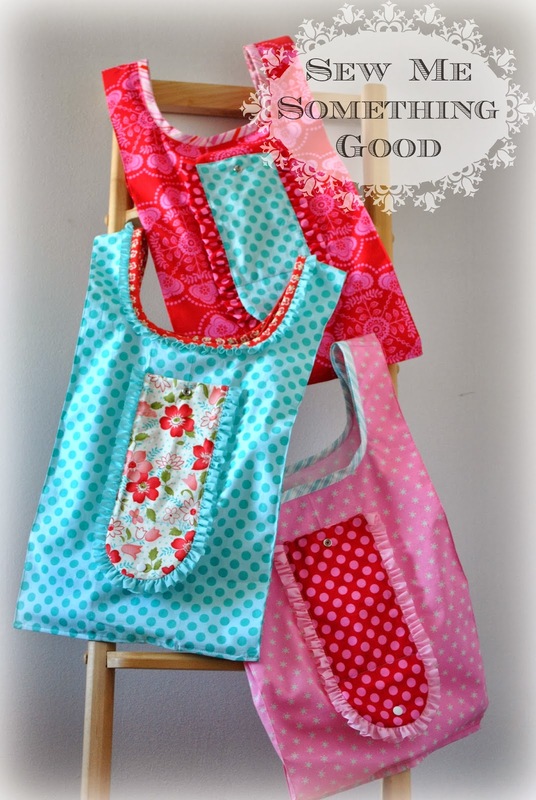 There may be a few more needed, perhaps in the smallest size, depending how my original layout idea goes. 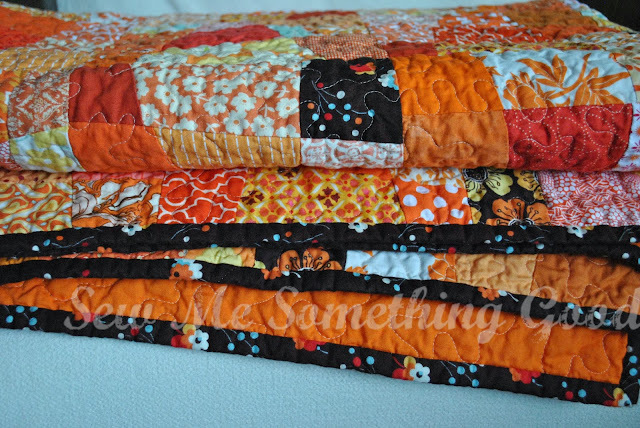 Since I don't seem to be short of fall colours in my stash, making more leaves won't bother me a bit. 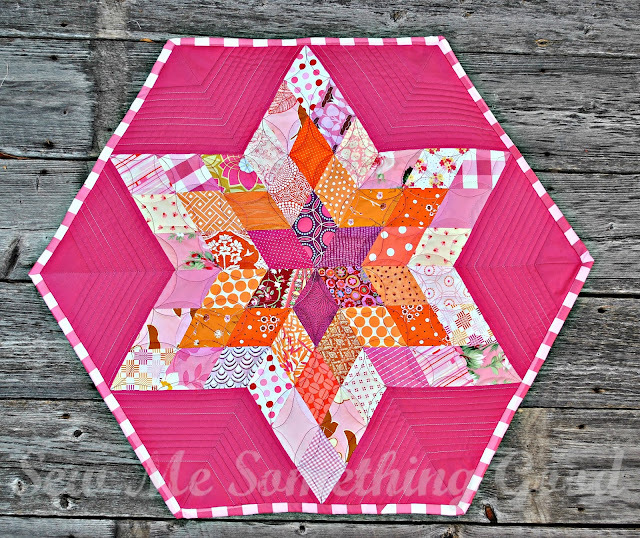 Better yet, any extras would be welcome in other projects (maybe some place mats... oh, yes!). Okay, so that's what I'm up to today, how about you? What are you working on? 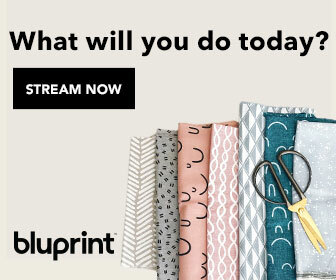 Interested in a peek at other projects in the works this Wednesday? Me too! 1. Swoon Quilt (or quilts). Blocks are made, but due to the varying sizes of those blocks I need to fashion a grid onto my design wall to help me proceed with the layout I envision. 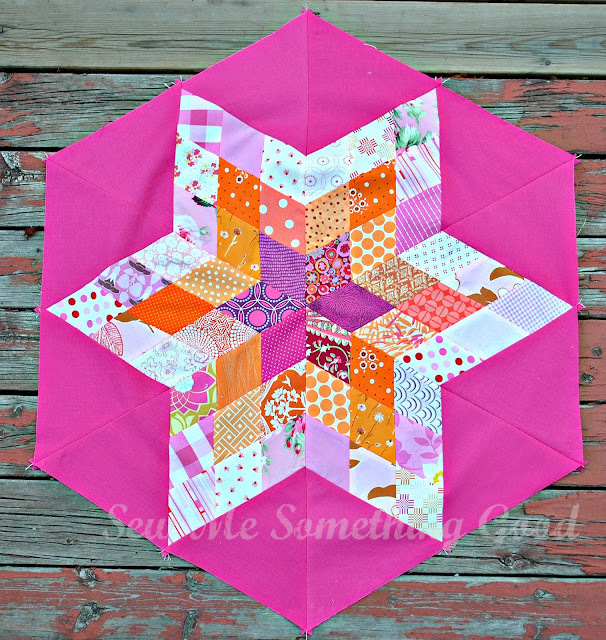 This project has been on my list for each quarter of 2013. 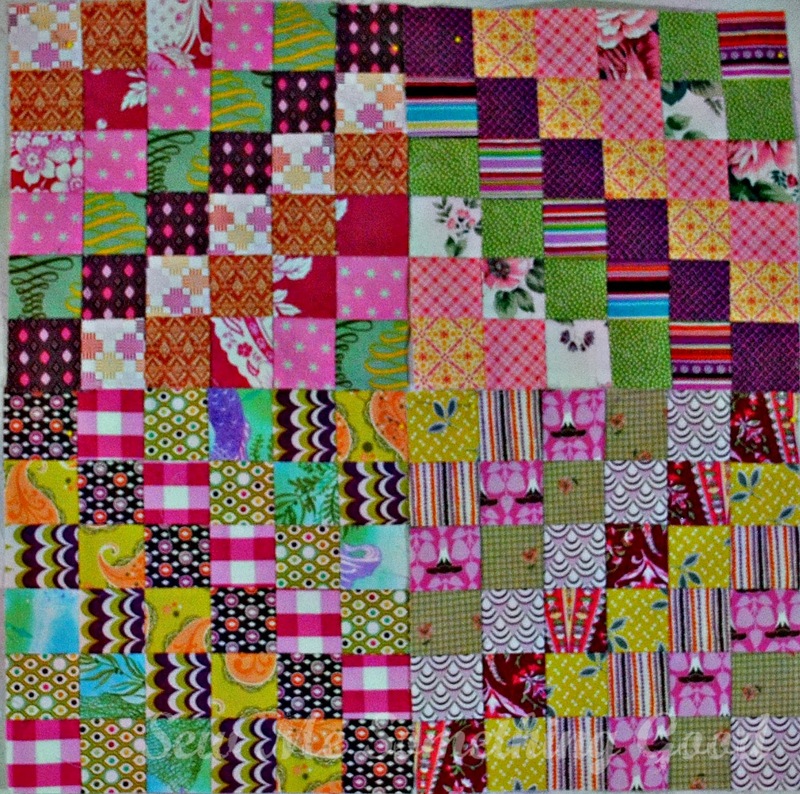 I'm making mini blocks and have sewn half of the total blocks I will need to make this into a king-size quilt. The strategy to get more blocks made is to use these as "leaders and enders" to help guarantee a finish by the end of the year. Fingers crossed that this will work! 4. 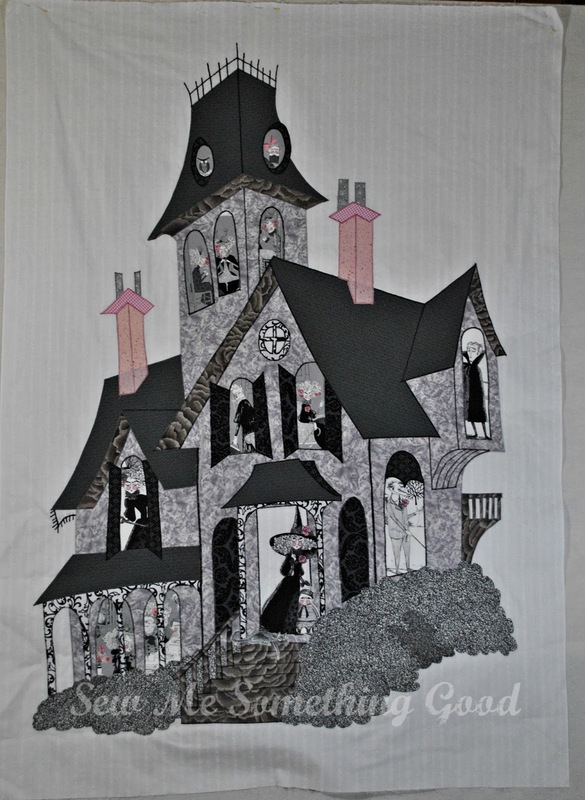 Ghastlie Manor Wall hanging. 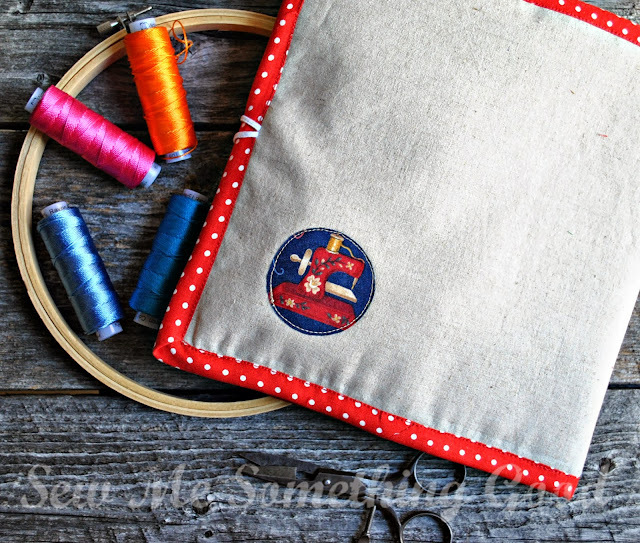 I want to add some sort of border and I may add a few more touches of machine embroidery to finish this project that I dreamed up. Can't believe it's been unfinished for a couple of years now. 5. 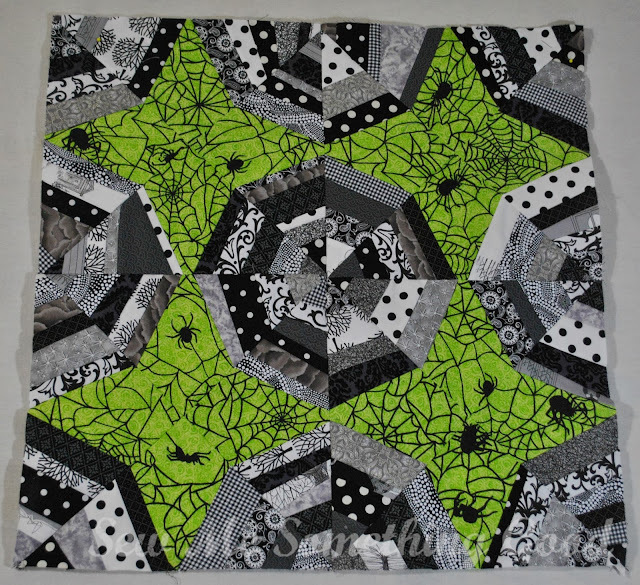 Creepy Spider Web Quilt (or Wall hanging). 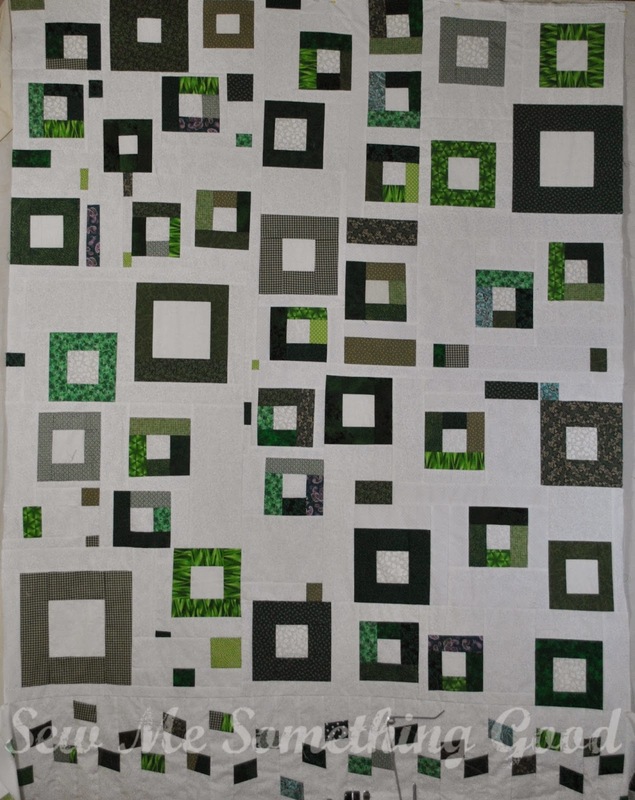 I need to make as many blocks as possible using the remaining lime fabric I have on hand - so not sure what size this will end up being. Just want it done! Yet another project that has been put aside for quite some time. I have removed some parts as I wasn't happy with what I had and know I just need to stop dithering and finish. 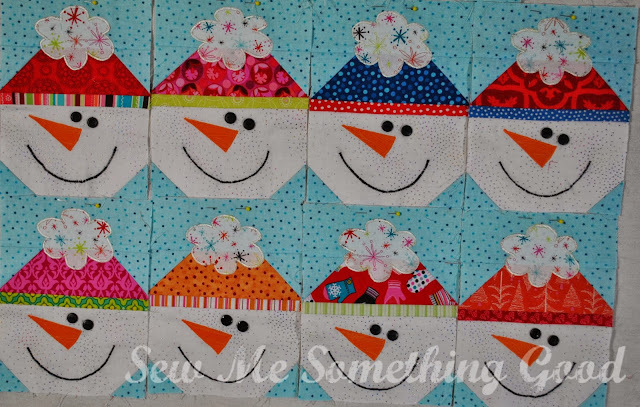 I whipped up these cute fellows a year ago and then stalled out on a finish for them. I've begun sketching projects using them and would love to have them for decorating for the holiday season this year. 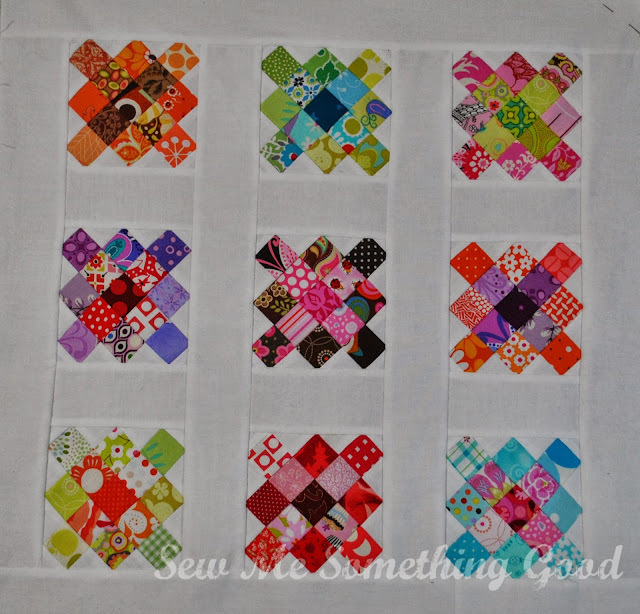 I'm finally sewing up blocks I've had designed for about a year. I'm still playing with project ideas for them and would love to have them ready to share as a PDF pattern this quarter. 10. 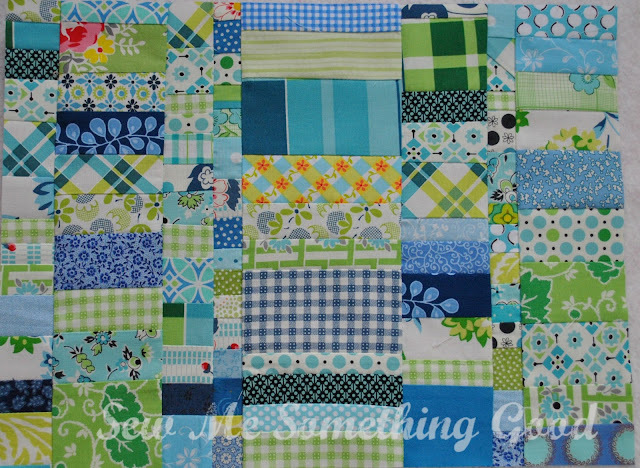 Possibilities in Blue and Green. 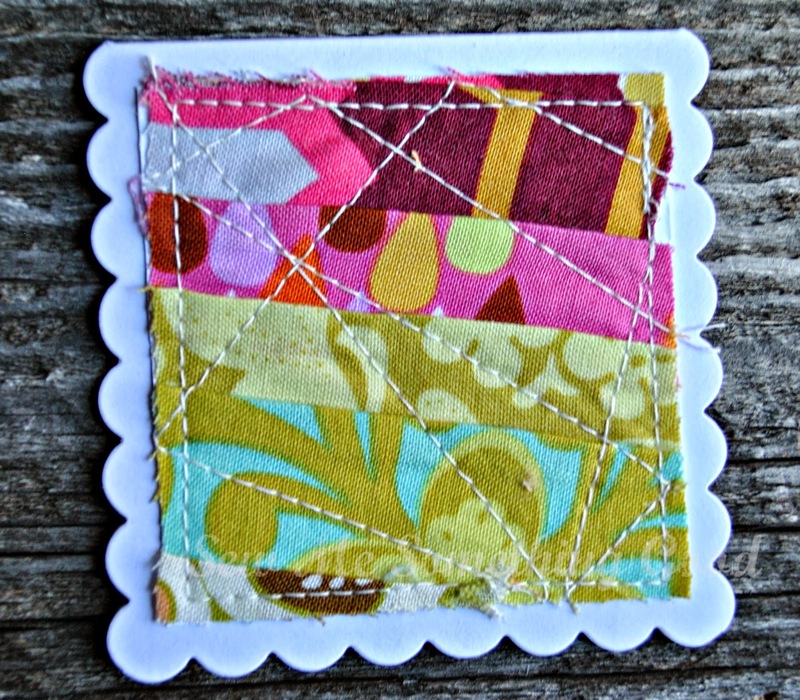 Yes, this WIP has been on a couple of FAL lists, too. I've pieced more scraps together for this and still need to work out what I'm making with this scrappy yardage. The time has come for this to be a finish! 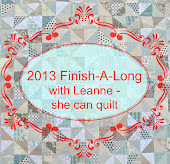 Time to link up my list with Leanne and all the other lovely ladies participating in the homestretch of this year's Finish-A-Long. Best of luck to each of you!